It’s August, so we’re coming up on the day a year ago when the Peabody Essex Museum quite suddenly closed the doors of its temporary Phillips Library facility in Peabody and issued an ominous and mysterious statement that the Library would be opening up in a “new location” in the spring. In December, the Museum announced admitted that this new permanent location would be the town of Rowley, where it had purchased a utilitarian structure to house its amalgamated “Collection Center” (why is it not Collections Center—just not indiscriminate enough?) And just like that, Salem’s oldest and most comprehensive archive was gone, along with the very special library that had housed it for well over a century. The Collection Center Library, which I cannot bear to call the Phillips, is now open and able to accomodate 14 researchers in what is by all accounts (I haven’t been there yet, but I fear I will have to at some point) a massive structure, yet another indication that this facility was built to house material objects rather than texts: the announcement of its opening featured a curator examining a Chinese object. I’m quite aware that the PEM requires a vast amount of space to house its vast collections: I just don’t understand why this space could not have been found in Salem or why the Library had to be assimilated within it. 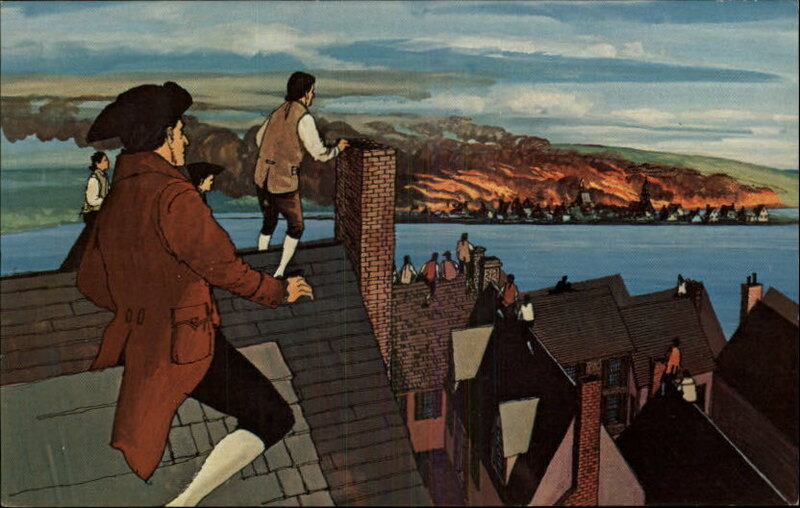 Through this whole saga, I’ve talked to many people who have been just as upset over the removal of objects from Salem as texts: the assorted Americana and maritime memorials of the former Essex Institute and Peabody Museum. For me, it’s always been exclusively about paper. But just the other day, someone took a picture of the crated doorway of the Gideon Tucker House, being readied for its departure to Rowley I presume, and I started to think about the loss of material culture for the first time when I went over to see it for myself. I guess I should be glad that this doorway still exists and is still—or has been–in Salem, as it is a long-admired example of Samuel McIntire’s work; indeed when students from MIT’s pioneering architectural school came to Salem in the summer of 1895 to measure and draw its storied buildings, their professor Eleazer B. Homer identified the elliptical doorway of the Gideon Tucker House (also called the Tucker-Rice House) as the “best-proportioned” in the city. We have photographs of the doorway in situ, but most images of it date from after 1896, when the Tucker house was acquired by the Father Mathew Total Abstinence Society and transformed into an institutional headquarters. By 1910 the famous doorway had been removed and donated to the Essex Institute, which eventually affixed it to the rear of Plummer Hall. I’m not sure when it was removed and placed in storage: Bryant Tolles refers to its relocated situation in his Architecture in Salem (1970) but the doorway of the “Grimshawe House” on Charter Street is affixed to the rear of Plummer at present–and has been for some time. Across Essex Street, the Gideon Tucker house was further “denatured” by the addition of commercial storefronts in the mid-twentieth century, but fortunately rehabilitated for residences under the supervision of Newburyport architect Jonathan Woodman in the 1980s, at which time it acquired its reproduction entrance. The Gideon Tucker Doorway and House (1804): Frank Cousins photographs from the 1890s; the Brickbuilder, January 1924; New York Public Library Digital Gallery, n.d.; Essex Institute postcard, MACRIS (1979) and present. The Essex Institute garden must have been a very interesting place to visit in the midst of the twentieth century with its eclectic mix of houses and house parts assembled by George Francis Dow: in addition to the Tucker Doorway, there was a McIntire cupola from the Pickman/Derby/Rogers/Brookhouse Mansion which was demolished in 1915. It was infested with beetles and destroyed in the 1970s, and only its eagle survives. I am grateful that this beautiful doorway has not met a similar fate, along with all the architectural fragments in the PEM’s collections, but the removal from the cultural context which created them makes me anxious for their future significance—and meaning. “Eh bien, Messieurs! deux millions”: Napoleon displaying the treasures of Italy—in France, 1797, Library of Congress. In honor of Napoleon’s coronation as Emperor of the French (not Emperor of France, an important distinction and consequence of the French Revolution) on this day in 1804 I thought I would explore his adoption of bee symbolism in greater detail than my first attempt a few years ago. 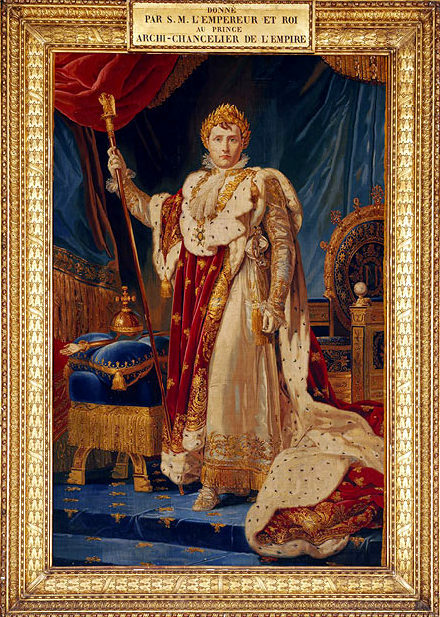 Napoleon had to pay tribute to tradition in order to legitimize what was essentially a military coup d’etat–and bees go way back, not as far back as the Roman laurels and eagles which he also adopted, but way back in French history. In my previous post, I identified Charlemagne as the source of Napoleon’s bees, but actually it was Childeric, a Frankish king who was the father of Clovis, who converted to Christianity and unified all the Frankish tribes under his sacred kingship after 496, the first of the Merovingian line. 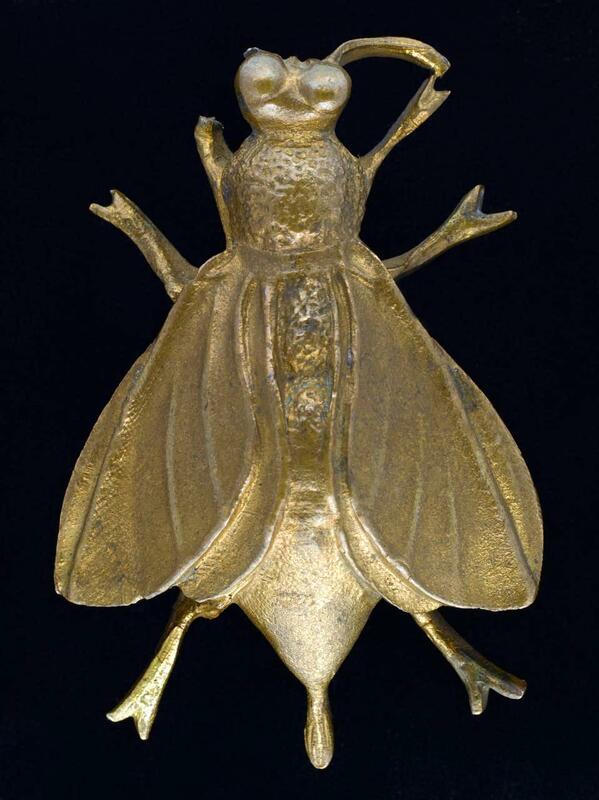 Childeric’s grave was accidentally discovered in Tournai in 1653, and inside his tomb was a treasure of coins, jewelry, iron, and 300 bees (sometimes referred to as “fleurons” or cicadas but they look like bees to me, and apparently also to Napoleon). 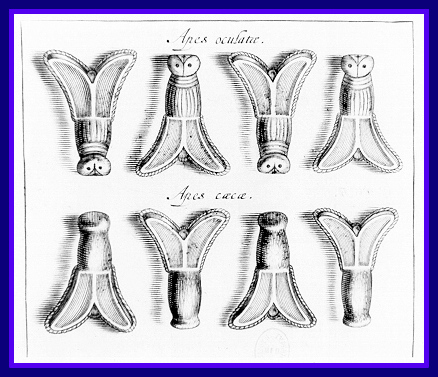 The governor of the Spanish Netherlands commissioned his personal physician, Jean-Jacques Chifflet, to catalog and study the finds, which were published in one of the first archeological works in European history, Anastasis Childerici I Francorum regis, sive thesaurus sepulchralis Tornaci Neviorum effossus et commentario illustratus (1655). 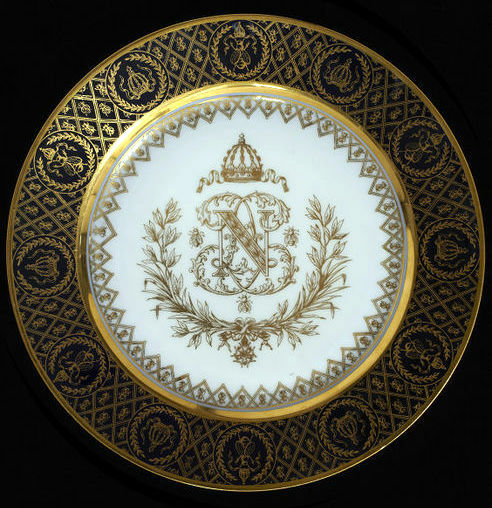 One hundred and fifty years later, when Napoleon was looking for a “French” symbol that was not a Bourbon Fleur-de-lis, the bee seemed to fit the bill, and it was lavishly utilized in his coronation–and after–essentially becoming the “Napoleonic bee”. 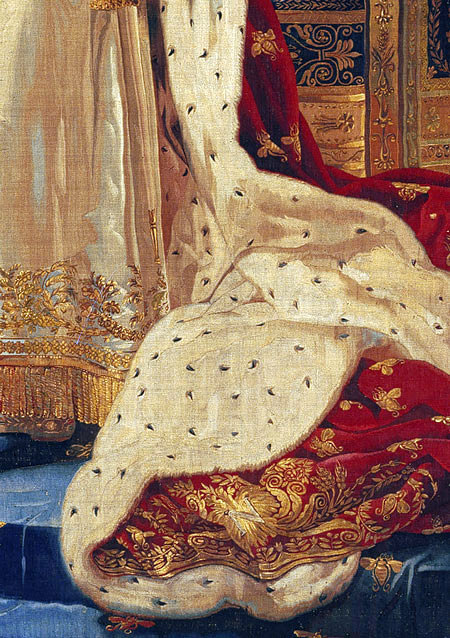 King Childeric in British Library MS. Royal 16 G VI f. 9; Childeric’s bees in Chifflet (1655); a Napoleonic bee from his 1804 coronation robe; tapestry portrait and detail of the coronation robe after a painting by Baron François Gérard, 1805, Metropolitan Museum of Art; Napoleon’s half-American nieces, “The Sisters Zénaïde and Charlotte Bonaparte”, sitting on a bee-upholstered couch, Jacques-Louis David, 1821, Getty Museum; the full Napoleonic regalia, bees and all, Sèvres plate, 19th century, Victoria & Albert Museum. 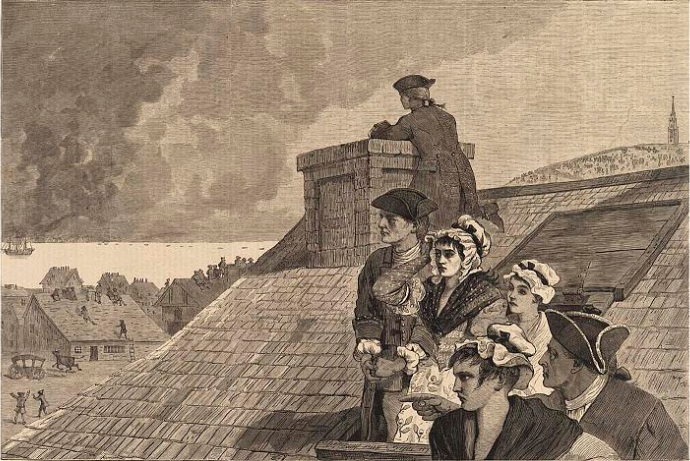 With two big battle anniversaries converging–that of Bunker Hill on June 17, 1775 and Waterloo on June 18, 1815–I was looking at contemporary and commemorative images of both contests and noticed the preponderance of bystanders, observers, and public reaction perspectives. These two battles seem very public, but of course all battles are, and these two were particularly epic, marking the commencement of the American Revolution and the defeat, finally, of Napoleon. View of the attack on Bunker’s Hill (really Breed’s Hill), with the Burning of Charles Town, June 17,1775, drawn by Mr. Millar, engraved by Lodge (1775), Library of Congress; Print of an anonymous etching of the Battle of Waterloo with the key officers (c. 1815), British Museum. 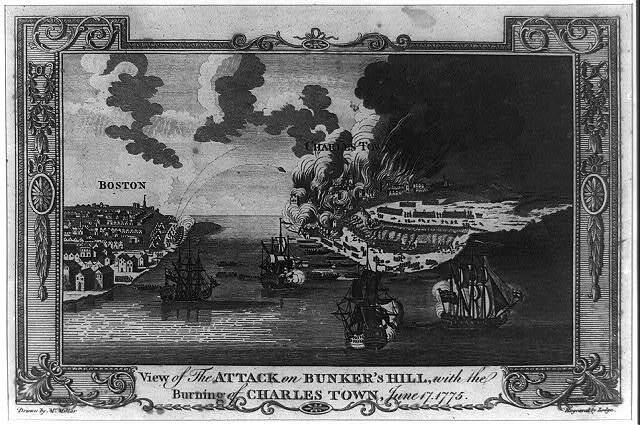 Both battles were followed pretty quickly by reports from “near observers” for audiences hungry for results, and details: the deaths of Major Pitcairn and Dr. Joseph Warren at Bunker Hill, dashing displays of bravery in both battles, the capture of Napoleon (finally) several weeks after Waterloo. 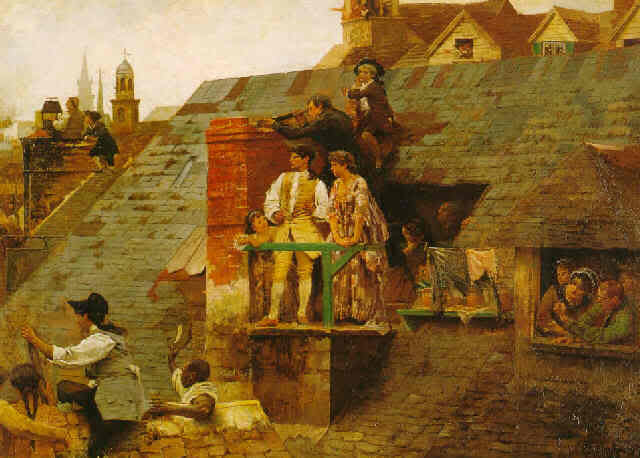 With time, as both events become part of history and national memory, the people get more involved with the emphasis on observation and reception, which is particularly apparent in composed images of the battles. 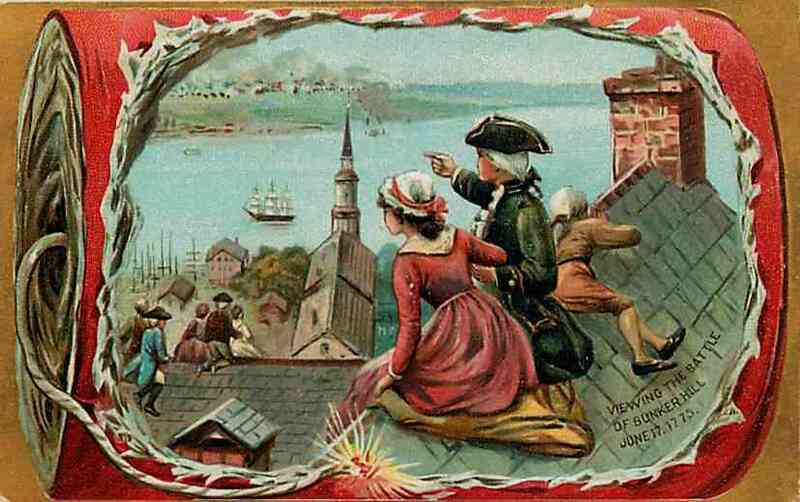 I particularly like the “watching from the rooftops” images of Bunker Hill, which began with Winslow Homer’s 1875 engraving for Harper’s, and continued through a series of popular postcards published by Raphael Tuck & Sons. 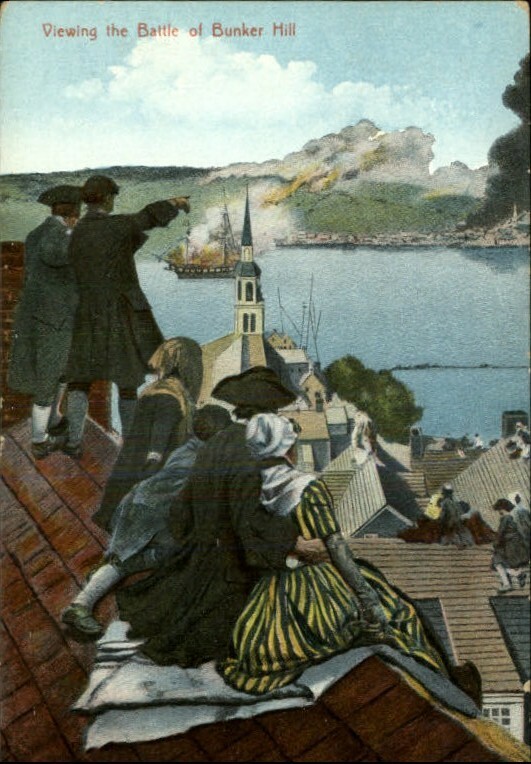 Winslow Homer, The Battle of Bunker Hill–Watching the Fight from Cobb’s Hill in Boston, Harper‘s Weekly, June 26, 1875; Edwin Howland Bashfield, Suspense: The Boston people watching from the house tops the firing at Bunker Hill (1882); Raphael Tuck & Sons postcards, circa 1910. 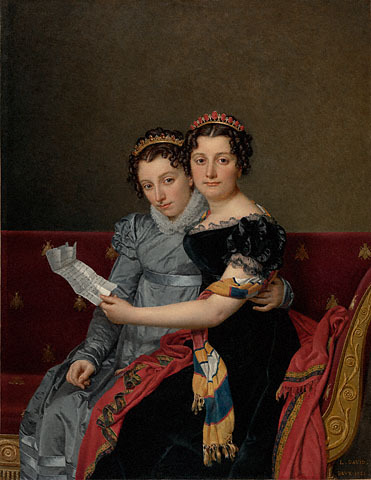 I remember reading the sections on the Battle of Waterloo in Thackeray’s Vanity Fair and thinking: it seems like they’ve gone right from the ballroom to the battlefield (which they did) and what is Becky doing there? This was a strange battle, but certainly a momentous one. 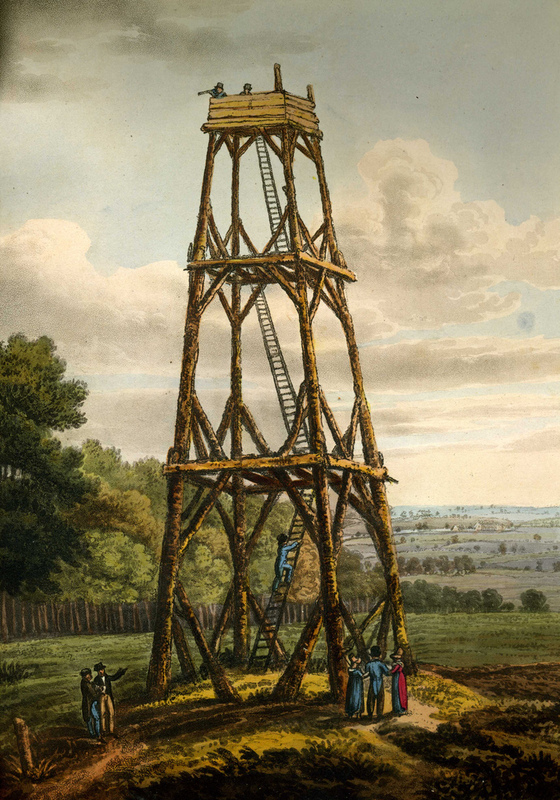 You can certainly ascertain the intense interest of civilians both in the vicinity of the battle and on the homefront in two striking images: the first, from William Mudford’s Historical Account of the Campaign in the Netherlands in 1815 (1817), is of the observatory tower commissioned by the King of the Netherlands, erected so all of those people at the ball could see the battle. The second is David Wilkie’s Chelsea Pensioners (1822), in which a very inclusive British public receive news of the big victory at Waterloo. 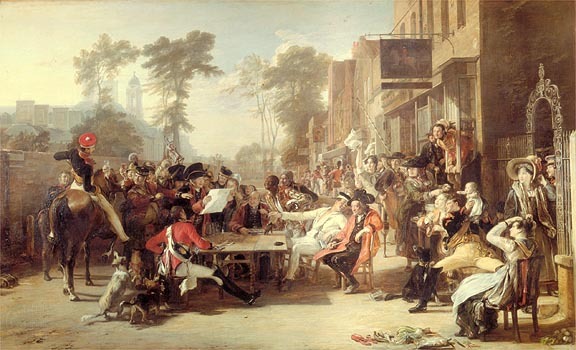 James Rouse painting, from Mudford’s Historical Account (1817); Sir David Wilkie, Chelsea Pensioners Receiving the London Gazette Extraordinary of Thursday, June 22 1815, Announcing the Battle of Waterloo (1822), Dulwich Picture Gallery.